Colour-Blocked Wedding Theme Ideas and Inspiration to Rock at Your Vibrant Wedding! Colours and Indian weddings go hand in hand. Our shaadis are just known for all their colour, their vibrancy and the brilliant pomp and splendour that they are celebrated with it. And while colour blocking is a major fashion trend, we might as well take advantage of it and incorporate fabulous colours in fabulous, unique ways to make that upcoming wedding an event to remember. So wouldn’t it be a good idea to switch things up a bit, ditch the usual red, orange and gold and try out some new colour trends that’ll ensure that your big day remains one of a kind?! Colour blocking is best done with bright, happy colours that could be of contrasting shades or of the same family. So all you need to do is pick your favourite colours and aesthetically put them together. While the first part is easy, the part about getting it all done mayy be a little tasking. But not to worry, what we have here for you are some great colour-blocked wedding theme ideas to incorporate and have that picture-perfect scene that you’ve dreamt of! These are fairly easy to do. You can forget about all the complicated designs and hard-to-maintain paper. Check out these ideas for tips on how to colour block your wedding invites to have them looking casual and fun! For centrepieces, a simple idea would be to use wedding flowers of various bright colours and arrange the aesthetically. Colour blocked table settings could be done up with colourful sets of crockery or even bright table mats. Check out these décor ideas to creatively incorporate colour blocking in your wedding décor! Everybody loves cake. But what’s better than a white-glazed wedding cake? A colourful one! These brilliant colour-blocked cake ideas will definitely have you wanted to steal one of them for your upcoming wedding day. Wedding lehengas are just about the most important thing to any bride. But why stick to the usual and over used red and gold palette? Try experimenting with colours! 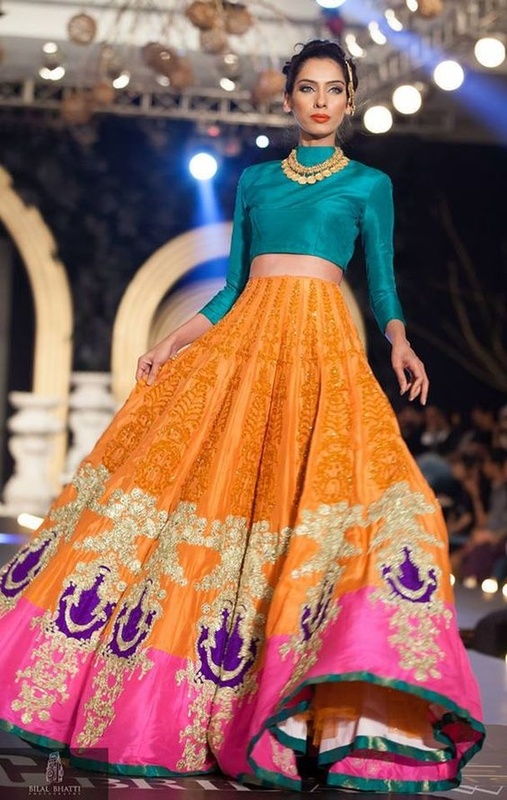 As colour-blocking is also a great trend, donning a colour-blocked wedding lehenga will certainly give you plus points on uniqueness! Your guests would love these. Hand out colourful cookies or macaroon boxes. If you want something a little more long-lasting, you coul try colour-blocked soaps or candles! Colourful sunglasses and sand jar keepsakes work great for a beach wedding.